Angel was born in Havana, Cuba. At the age of 6 he and his family migrated, and since then, he was raised in South Florida. Since a young age, Angel has been serving at the local church. 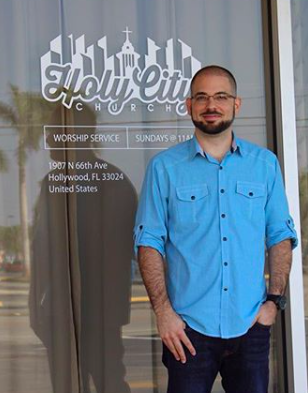 He has been with Holy City Church for more than 5 years and he currently serves as the drummer, and primarily as Pastor. Angel is passionate for the church souls, discipleship, and spiritual growth. Any time an opportunity comes up to teach and talk about our savior, he is always up for it. He loves to study the Word, serve others, and share the good news of Jesus Christ. During his free time, he enjoys music, watching movies, and spending time with the family. Angel is married to his wife Idania and they both have two God loving kids: Jocelyn and Adam.